Combative Unifor leader Jerry Dias has declared NAFTA a failure for workers in all countries and has insisted Canada would press for higher labour standards in both the U.S. and Mexico. 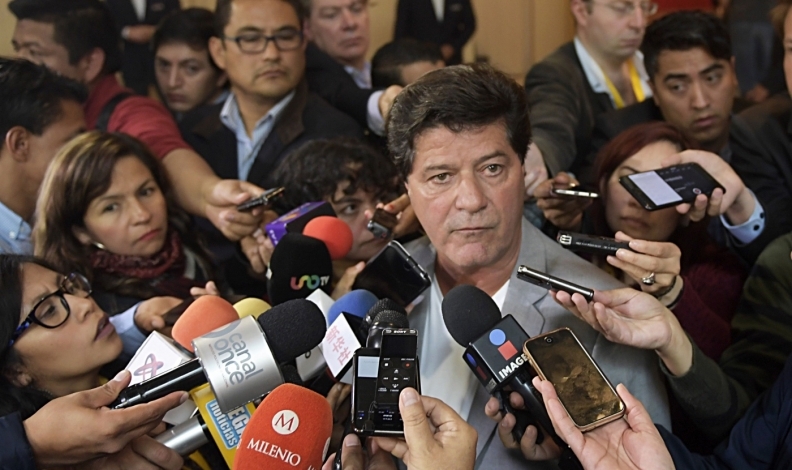 In Mexico City’s NAFTA talks last week, few Canadians had a higher profile than Jerry Dias. He spoke to a labour rally and a conference. He met at length with Canada’s chief negotiator, Steve Verheul, over red wine and bar nuts. He held court with reporters regularly. Yet Dias is no government minister or aide. He’s the head of Unifor, Canada’s largest private-sector union, which includes about 25,000 jobs in the auto sector, and hates the North American Free Trade Agreement, whose second round of negotiations concluded Sept. 5. And he’s at the forefront of Prime Minister Justin Trudeau’s renegotiation strategy — a reminder that, like Trump, Trudeau has his own economic interests and domestic politics to cater to. That means giving labour a prominent seat after Trump spurred new NAFTA talks. Trudeau, the country’s most left-leaning prime minister since his father, has repeatedly said the new NAFTA must be more progressive. Among its core objectives, Canada has proposed including environmental provisions and those related to gender and the rights of indigenous peoples. But it’s labour that’s been at the forefront. Enter Dias. Speaking in Mexico City, the combative union leader declared NAFTA a failure for workers in all countries, insisted Canada would press for higher labour standards in both the U.S. and Mexico and called Donald Trump “crazy” while sounding a lot like the U.S. president in decrying job losses. Trudeau is indeed pressing for stronger labour rights, a stance that will add another hurdle to reaching a timely agreement as Dias essentially sets the tone on the government’s behalf. With U.S. and Mexican elections looming, the three countries are accelerating talks in hopes of reaching consensus before the end of the year. labour’s prominent role underscores Canada has its own political considerations too. Trudeau won power by shifting his centrist Liberal Party to the left and has since wooed labour. “Comparatively to the last government, it’s night and day,” said Hassan Yussuff, head of the Canadian Labour Congress and an appointee to Foreign Minister Chrystia Freeland’s NAFTA advisory panel. Others tapped for the panel include former Conservative lawmakers, whose party was at odds with the labour movement while in government, and a senior figure from the New Democratic Party, typically the most closely aligned with labour. “Her natural ability to work with labour is something very welcome to us," Yussuff said of Freeland. Among Canada’s proposed NAFTA changes is an overhaul to U.S. and Mexican labour law, according to an official familiar with the talks, including so-called U.S. “right-to-work” rules, derided by labour leaders, that ban unions from requiring workers to pay dues. The U.S., while sure to balk at that, is with Canada in pressing for higher wages — though Mexican Economy Minister Ildefonso Guajardo said there’s no consensus on how to do that. “On this you’ll have two groups of ideas that could contrast,” he told reporters as the second round of talks concluded. Those include “institutional improvements in labour rights” and a process of forcing through higher salaries, he said. He opposes the latter measure. After Trump’s election, Trudeau shuffled his cabinet to prepare for talks — making Freeland his foreign minister and leaving NAFTA in her hands. Shortly afterward, the Trudeau government invited Yussuff for a meeting. He spoke with Trudeau’s two top aides, Gerald Butts and Katie Telford, and the prime minister himself. Yussuff said they wanted to know whether or not his labour group would work with them. It’s clear labour was part of Trudeau’s plan. Cameron Ahmad, a spokesman for Trudeau, said his senior aides have met regularly with Yussuff and other labour leaders. A strong and respectful working relationship with Canada’s labour movement “is critical for our government," Ahmad said. In the lead-up to talks, government officials speaking on condition of anonymity said labour leaders in particular had the ear of the government. “This one is left-of-center,” Dias said of Trudeau’s typically centrist Liberal Party. “The Canadian government is by far the most progressive of the three, and we’re here to work with them and they know that we’ll go right off the walls if in fact it’s all rhetoric and it becomes the status quo” with NAFTA. In the 2015 election, the incumbent Conservatives were unpopular and Trudeau moved to the left — they pledged an expanded national pension program, deficit spending and a tax hike on top earners — to squeeze out the New Democrats and contrast the conservatism of incumbent Prime Minister Stephen Harper. His NAFTA strategy suggests he’ll do the same thing in Canada’s next election in 2019. Speaking to reporters in Mexico City, Freeland demurred when asked for details of negotiations so far, though cited labour as a commitment. The pledges Trudeau is making to Canadian labour will make it tougher for him to compromise at the NAFTA table. Yussuff said the government will need to press Mexico in particular to honor pledges for labour reform, while Dias insists all three countries need to honour eight core conventions, including the right to organize, laid out by the International Labour Organization to make NAFTA work. Dias wants raises big enough that Mexican auto workers can all afford to buy the cars they make. The prominence of Canadian labour suggests Freeland is largely on-side — and is now pressing the issue at the NAFTA table. “This is an opportunity to show, hey we’re seriously committed to working with you to make the relationship much stronger,” Yussuff said of Trudeau’s ties with labour during NAFTA talks. "At the end of the day, they’re not negotiating with themselves. They have to convince Mexico and the U.S. to equally agree to these changes."